Garraway's Coffee House was one of the chief auction houses in the City at the time of this survey. Opened in 1669 the house auctioned property, textiles, spices and salvaged goods. Thomas Garraway was also the first man in England to sell tea. This plan distinguishes individual lots with various pastel shades. 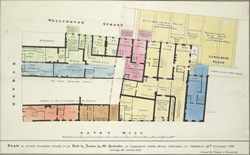 The upper-left section of the plan shows one of Sotheby's first premises, featuring an auction room for engravings and pictures, a warehouse for books, and a counting house. Established in 1744 by Samuel Baker, this firm of auctioneers traded from 13 Wellington Street from 1818 before moving its main offices to New Bond Street in 1917.